Natural, organic and rich in antioxidants. Effectively Exfoliates, Softens and Deeply Moisturizes skin. 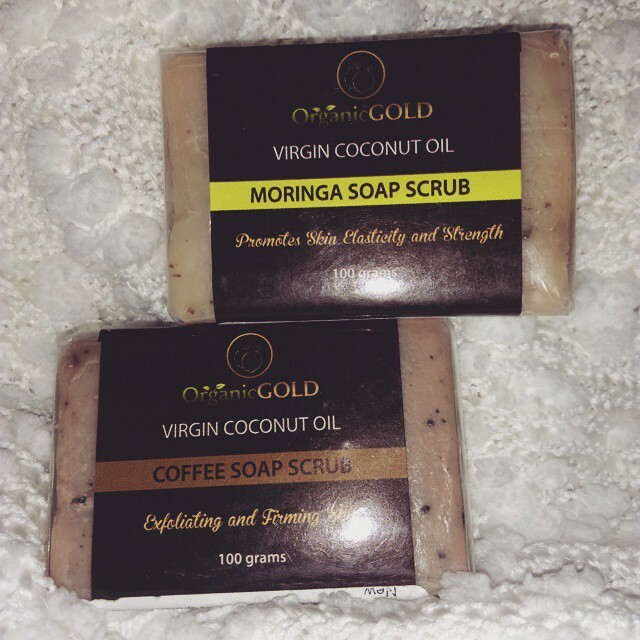 Made from pure Virgin Coconut Oil with 2 variants - Moringa leaves & Coffee Beans. MORINGA SOAP SCRUB- This bar of soap has a nice floral scent to it. Not too over powering at all. I like using this in the morning on my face. It gives me a nice clean, fresh feeling. Nice lather. It leaves my skin feeling nice, refreshed and squeaky clean. I only use this about 2-3 times a week. This soap is standard bar soap size. COFFEE SOAP SCRUB- This bar of soap has a nice subtle coffee scent which I quite like. It's not over powering at all. The size of the soap bar is fairly standard, good for washing hands, face and body. It provides a very mild, gentle exfoliation on the skin. The soap lathered up very nicely, and provided a great washing experience. My skin was left feeling soft and hydrated. This gives the squeaky clean kinda feel. I love handmade soaps / specialty soaps, and I am always willing to pay more for them, simply because a lot more work goes into them. My only issue with these is that they are a little too expensive for my liking. If the soap was priced a bit more reasonable, then I would give this a full 5 star recommendation.